It has been nearly 20 months since Cascadia Wildlands, Oregon Wild and Center for Biological Diversity were granted an injunction against the state killing wolves in Oregon. Prior to filing the case, two things became clear: 1) the state of Oregon was becoming more comfortable killing endangered wolves, and 2) not enough was being done on the ground to prevent conflict between livestock and wolves. So we litigated and stopped the lethal control, protecting the approximately 14 wolves in Oregon at the time. On May 23, Cascadia Wildlands and Oregon Wild settled the case after 17 months of significant negotiation with the Oregon Department of Fish and Wildlife, Governor John Kitzhaber’s office and the Oregon Cattlemen’s Association. This agreement will have positive and lasting implications for wolves and expedite their remarkable recovery back into Oregon. 1) It incentivizes responsible livestock husbandry. 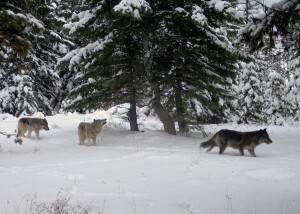 In order for a livestock depredation to qualify toward the “chronic depredation” threshold, which can trigger lethal control, the new plan requires livestock producers to use pro-active and non-lethal techniques to reduce conflict between wolves and livestock. Examples include removing wolf attractants such carcass and bone piles, using electrified fencing, employing human presence while livestock grazes on the open range, and protecting herds at their most vulnerable times, like during birthing, and nursing. It also requires the creation of an area-specific conflict deterrence plan by the state and livestock producers that best fits the particular depredation situation. Prior to the injunction, there was not a clear action plan to be followed to reduce conflict. 2) It redefines “chronic depredation.” “Chronic depredation” is now defined as four depredations by the same wolf or wolves reasonably believed to be responsible for the incidents within a consecutive six-month period. Prior to the settlement, “chronic depredation” was defined as two livestock depredations over an unspecified period of time in an undefined area. 3) It requires public accountability. Unlike prior to the injunction, the Oregon Department of Fish and Wildlife must now make information readily available to the public at least on its website, including maps of “areas of known wolf activity” and “areas of depredating wolves,” livestock depredation investigations, non-lethal and proactive techniques used by livestock producers in each incident, area-specific conflict reduction plans, and lethal control requests. Prior to the injunction, we were met with resistance trying to obtain this kind of critical information, and when public information requests were made, released information was incomplete. In addition to these notable gains, the agreement sets the stage for gray wolf recovery in the rest of Oregon and the region because this new rule governs the western recovery zone of Oregon (west of Hwy 97/20/395) even after recovery objectives are met in the eastern recovery zone (east of Hwy 97/20/395). This transition from Phase I to Phase II of Oregon wolf recovery is expected by 2015 when we will likely have at least four breeding pairs of gray wolves for three consecutive years in the eastern zone. (Per the Oregon Wolf Plan, a breeding pair is defined as a pack with at least two pups that survive through the calendar year.) Having this new rule in place in the western recovery zone of Oregon will be critical to ensure wolves advance into the Cascades, Coast Range and Siskiyous, and ultimately, California. Some will ask why we opted to lifted the stay on wolf killing and settle the case. The answer is fairly simple: It is our job to do what is best for wolf recovery in the state and region, and to do this, we keep as informed as possible, read the politics, and then make decisions. All indications pointed to legislation likely to pass into law in Salem that would moot the stay and reinstate the plan we originally challenged. This outcome would mean more dead wolves more often and take us back to square one. Instead, we leveraged the stay against killing wolves as much as reasonably possible in the negotiation to get an outcome that is profoundly better for wolf recovery. Moreover, the new agreement garnered buy-in from the livestock industry, and now all the stakeholders know exactly what is expected on the ground in order to get to the newly defined “chronic depredation” threshold. Today, there are approximately 50 known wolves in Oregon across seven packs clustered in the northeast portion of the state. When this year’s crop of pups emerge from their natal dens in the next few weeks, this new historic agreement is expected to be locked into place and will likely provide a management template for other states who are beginning to see wolves return. As a consequence, we believe this agreement will help reduce conflict on the ground and predict the wolf population in Oregon will expand sooner into places like the John Day, Three Sisters, Crater Lake, Klamath Basin, Kalmiopsis and other famed landscapes that evolved with wolves for millennia.